1. Oil a 20x20cm square cake tin and line with a sheet of clingfilm. Grease the inside of the clingfilm with more oil to stop the marshmallow from sticking. Pour the coconut milk into a large bowl or the bowl of a stand mixer and sprinkle over the gelatine. Set aside for a few minutes to allow the gelatine to soften and absorb the liquid. 2. While the gelatine is soaking, put the caster sugar and golden syrup in a saucepan with 150ml of water. Cook over a low heat, stirring all the time, until the sugar has dissolved. As soon as there are no longer visible grains of sugar, turn up the heat and bring the mixture to the boil. Once it reaches 130°C take it off the heat and allow to cool for 1 minute so the mixture is no longer bubbling. 3. Start whisking the gelatine/coconut mixture on a medium speed. Add the syrup, slowly pouring it down the side of the mixer bowl. The mixture should become pale and grow in volume like a very stiff meringue. Continue to whisk for 5-10 minutes, until the marshmallow mix becomes really thick and starts to form sticky strings on the outside of the bowl. 4. Use an oiled spatula to scrape the mixture off the bowl and spread the mixture into the prepared tin. Sieve the icing sugar and cornflour together into a small bowl and stir in the desiccated coconut. 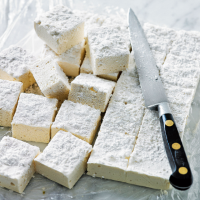 Sprinkle some of the powder over the top of the marshmallow, then leave to set for at least 2 hours (preferably overnight) at room temperature until the marshmallow feels firm. This recipe was first published in Thu Apr 06 10:07:00 BST 2017.